Last week according to Lt. Col. Dave Thompson, the Marine Corps' top robot-handler, we learned that 1 in 50 U.S. troops in Afghanistan is a robot. (This statistic with article an accompanying article was first reported by David Axe at Wired's Danger Room) By 2013 the number will likely increase to 1 in 30. This weekend at CNN we got to give you a look at one of the most popular military robots; the PackBot. PackBot is made by iRobot - a company known for its home appliances like the Roomba as much as they are for their military bots. Over 3,000 PackBots have been delivered to military and civil defense forces around the world. Small in size but that actually makes him even more efficient and portable. In short, PackBot’s mission is to get in the line of fire. - Lift up to 30 lbs. 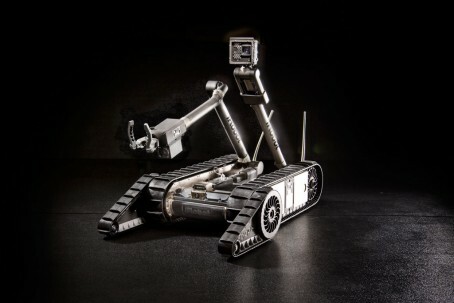 PackBot robots were present at the WTC site after 9/11 attacks and is widely used in all terrain areas like Iraq and Afghanistan. The PackBot can travels at speeds of up to 6 miles per hour and easily climbs stairs. It can withstand being thrown into a window and flip itself over if it lands on its back. Many assume a soldier would need hours of training to be able to operate the PackBot, not really. It is controlled by an Xbox or PlayStation controller - a controller most young soldiers are already familiar with. Also, it is key that the PackBot is portable at 60lbs and the SUGVEE (its more mobile counterpart) is even lighter at 30lbs. It can be ready to go in under 2 minutes. PackBots are incredibly a la carte. Think of them like an erector set. They can be configured and customized depending on the needs. The operator can swap in and out (plug and play) different sensors and/or arm configurations quickly. This makes one robot platform well suited for multiple missions. The 510 PackBot can be hand carried and deployed by one person in less than two minutes. No expensive, specialized equipment or vehicles are necessary; PackBot can be easily loaded into a MOLLE pack, the trunk of a car or a helicopter and then good to go. Cost is depending on set up, but they average about $100K. According to a new study by ABI Research, Defense Robots: UAVs, UGVs, UUVs and Task Robots for Military Applications, the global market for military robotics will grow from $5.8 billion in 2010 to more than $8 billion in 2016. How many lives has the PackBot saved? It’s difficult to count the lives saved, however, iRobot receives a lot of postcards and thank you notes from soldiers. The bot is kind of a hero in his own sense and even has his own Facebook page where soldiers write in.